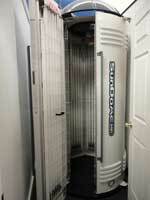 We have added 2 new Tanning Units; 1 lay down and 1 Stand-up. these are very hot units with no waiting! 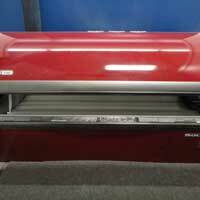 Our Solaris® 452 is now available in a 12 minute session, to meet with the needs of our tanning clients. With high power, 160 watt lamps in the canopy, you will love the comfort, power and beautiful long lasting tan. At Plainfield Gym and Tanning, tanning is included in your $15 a month membership. We strive to offer you a quality tanning experience that tanning salons cannot. Unlike those large national chains, we take pride in our comfortable atmosphere, spacious rooms and our commitment to our customers. A superior tan without the wait. Our Solaris Tanning Bed uses 160 watt bulbs and is maintained regulary, a committment to giving each of our clients a superior tanning experience at an affordable price. Our large beds, spacious rooms, friendly and knowledgeable staff and relaxed atmosphere provide the type of experience and service you deserve. The Sun Dome, to your right, provides a no contact (stand-up) tanning experience. This booth is equipped with new 160-watt tanning lamps for head-to-toe, side-to-side tanning and a cooling fan to assure you stay cool and comfortable while tanning in this machine. This Sun Dome, specially designed booth, is shaped so that you are at the center of the tanning intensity to get evenly showered with bronzing, all-over tanning power. At Plainfield Gym and Tanning there are no additional sign-up Fees, no cancellation fees and no contracts. Tried other tanning salons in the Indianapolis area, and weren’t satisfied? Come in and experience the Solaris difference at Plainfield Gym and Tanning.